A resting sperm whale, photograph by Brian J. Skerry, image from National Geographic. How is sound different underwater? Sound is produced when an object vibrates, producing a pressure wave that can travel through many materials. Sound obviously travels through air, but it also travels through water. The density of water allows for sound waves to travel farther and at higher speeds. Sound waves (like water waves) can be described in terms of their frequency, wavelength, and amplitude. 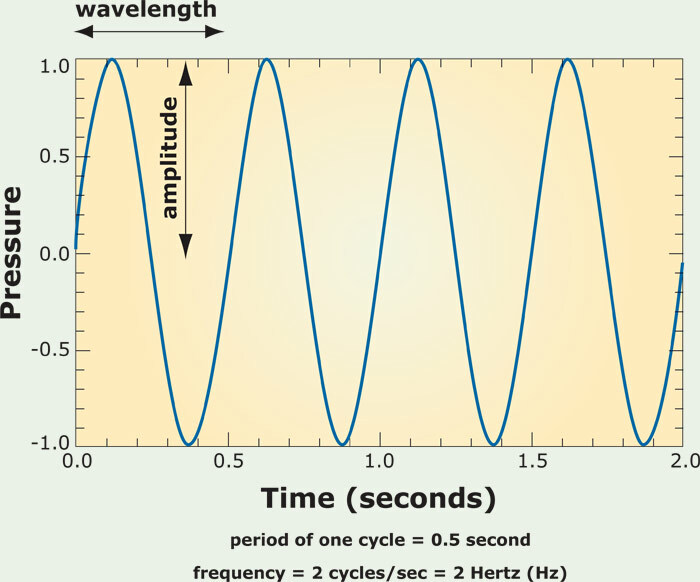 Frequency is the number of pressure waves that pass a point in a given time and can be measured in Hertz (Hz). To the human ear, an increase in frequency sounds like a higher pitched sound, while a lower frequency is sounds like a lower pitched sound. The voice of a soprano has a higher frequency that the voice of a baritone. Humans can hear sounds with frequencies between 20 and 20,000 Hz. Below 20 Hz, sounds are referred to as infrasonic, and above 20,000 Hz as ultrasonic. The frequency of “middle C” on a piano is 246 Hz. Parts of a sound wave, image from Dive and Discover. Wavelength is the distance between two peaks or two troughs of a wave. The lower the frequency of the wave, the greater the distance between crests, and the longer the wavelength. Sounds with longer wavelengths travel faster than those with shorter wavelengths. Amplitude describes the “loudness” of a sound and in a wave appears as “height. It can be measured in decibels (dB). Sounds waves that are “short” that have low amplitudes are quiet sounds, while “tall” waves produce loud sounds. It’s important to note that the decibel scale is a logarithmic scale. The difference between a sound that is 0 dB (barely audible) to one that sounds like a whisper at 20 dB is a sound that has been increased in loudness by the power of 20. Click here to read more. The SOFAR channel is centered on the depth where the cumulative effect of temperature and water pressure combine to create the region of minimum sound speed in the water column. Pressure in the ocean increases linearly with depth, but temperature is generally highest at the surface and falls rapidly through the thermocline until it reaches a set temperature near four degrees Celsius near one thousand meters in depth. Near the surface, the rapidly falling temperature causes a decrease in sound speed, or a negative sound speed gradient. With increasing depth, the increasing pressure causes an increase in sound speed, or a positive sound speed gradient. Therefore, a sound wave traveling through a thermocline tends to bend downward as the speed of sound decreases with decreasing water temperature, but then is refracted back upward as the speed of sound increases with increasing depth and pressure. This up-down-up-down bending of low-frequency sound waves allows the sound waves to be “trapped” in a channel and to travel many thousands of meters or even kilometers without the signal losing significant energy. Baleen whales appear to take advantage of this SOFAR channel to broadcast songs for great distances. Question 1: Read the text above and examine the diagram to the right. Write a 2-4 sentence explanation of how whales make use of SOFAR channels to extend the range of their vocalizations. Question 2: The Beaufort Sea has a unique SOFAR channel called the Beaufort Lens. How is global warming changing the sound transmission in the Beaufort Lens. How do we listen to whales? Bioacoustics is the study of sounds produced by animals. To listen to animals underwater, scientists use an instrument called a hydrophone. Hydrophones are waterproof devices that produce electricity when subjected to changes in pressure. These electrical impulses are converted back to sound waves that we can hear by a computer. The sounds produced by large whales are often in a frequency range far lower than the human ear can be perceived. When you listen to some of the sounds below, they may have been sped up many times over so that your ears can perceive them. An array is a network of hydrophones set out over a large geographical area. Hydrophone arrays can be useful for tracking or counting marine mammals. Question 3: Explain how scientists study whale sounds and communication using hydrophone arrays. To help you with this question, together in class we will watch an Idie Alaska episode on what its like to be a marine acoustician in Alaska. Baleen Whales: Baleen whales are generally more solitary than toothed whales. However, because of their size and the low frequency (long wavelength) sounds that they use, it’s possible for large baleen whales to have “conversations” with other whales hundreds, and maybe even thousands, of kilometers away. Most of the baleen whales (humpbacks being the most completely understood) produce songs as well as relatively simple communication calls. Question 4: Go to the DOSITS Interactive Sound Gallery or the Voices of the Sea Project. Listen to as many of the sounds as you like, then select two species of baleen whale and describe (in your own words) what each whale’s vocalizations sound like. Toothed Whales: By their very nature, toothed whales are all highly social. When you listen to their sounds, much of it will sound like “chirps,” “whistles,” and “squeaks.” These are often whales or dolphins acoustically connecting to members of their pod. Many toothed whales seem to have a need to “know” where each other is. Toothed whales also have highly sophisticated systems for using sound to locate prey known as echolocation. Question 5: Go to the DOSITS Interactive Sound Gallery or the Voices of the Sea Project. Listen to as many of the sounds as you like, then select two species of toothed whales and describe (in your own words) what they sound like. In your descriptions, you may want to compare and contrast toothed whales to baleen whales. Pinnipeds: Seals and sea lions also make a lot of sounds underwater. Their sounds are very diverse and not very well studied. Many pinnipeds will use the sea ice above them to amplify the sounds they make. Question 6: Go to the DOSITS Interactive Sound Gallery or the Voices of the Sea Project. Listen to as many of the sounds as you like, then select two species of pinnipeds, and describe (in your own words) what they sound like. You may want to compare and contrast them to the cetaceans. Every winter in the waters of Hawaii, the ocean is filled with the sounds of male humpback whales singing. The males seem to use these songs much like birds do. They sing to attract females, demoralize other males, or just to mark out auditory territories. The songs have a basic structure with a series of sounds repeated over and over again in patterns. Each pattern or phrase is then repeated several times to comprise a “theme”. A typical song is then made up of 5-7 themes that are usually repeated in a sequential order. A song typically lasts 8-15 minutes (although it may range from 5-30 minutes), and then is repeated over and over in a song session that may last several hours. A striking feature of the song is that it gradually changes or evolves over time. Each year, different sounds and arrangements of sounds form to create new phrases or themes. These changes are slowly incorporated into the song, while some older patterns are lost completely. The song apparently changes as it is being sung. The change in the song display seems to occur in a collective or common way throughout the population. Usually after a period of several years, the song is virtually unrecognizable from the original version. 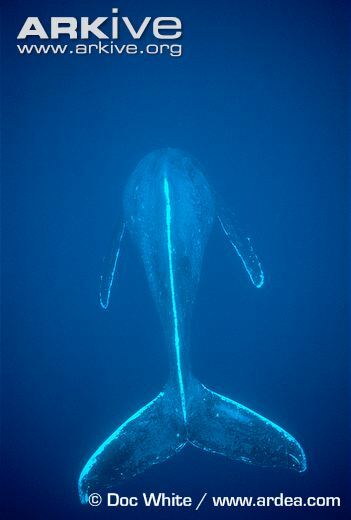 Question 7: After reading the text and listening to the recordings above, explain what you have learned about humpback “singing.” In your response, you may talk about the structure of the sounds themselves or why they use them. Sperm whales are by far the most acoustically active whales in the ocean. They have the most dramatic range of sound production and much of it appears to be used for locating prey in the deep and dark ocean, where they feed. Sperm whales use a unique organ called the spermaceti organ to produce their sounds. Here are some of the many sounds made by sperm whales. Question 8: Listen to three of the distinct hunting sounds made by sperm whales (above). Then watch “The Sperm Whale’s Deadly Call”, at smithsocianmag.com and describe what scientists are learning about sperm whales unique sonic abilities. In addition to communication, toothed whales have highly sophisticated systems for using sound to locate prey known as echolocation. These sounds are produced when air is blown through the blow hole causing internal lips near the edge of the blow hole to vibrate. These vibrations are then focused by large fluid filled structures in the head. In sperm whales, this structure is called the spermaceti organ. A sperm whale’s head is one third of its overall body length and the spermaceti organ is the largest structure in the head. The waxy lipid that fills the structure was once prized for its use in perfume. In dolphins, other toothed whales, this structure is known as a “melon.” When sound waves travel out into the water, they will bounce back when they hit a solid object. Returning sounds are picked up or “heard” in the whales jaw bone since whales and dolphins do not have ears. The jaw bones of most toothed whales are hollow, fluid filled, and have nerve endings for the detection of sound. Echolocation allows these whales (as well as bats and a few birds) to see by sound. Toothed whales perceive their environment much more by sound than by sight. Watch a narrated explanation of how sperm whales make their clicks (FLASH). Question 9: Create your own labeled diagram to show echolocation works. In your diagram, be specific to the structures of the head that produce and receive sound waves. Is the ocean getting too noisy for whales to hear themselves? We are making the oceans a noisy place. The oceans have become a noisy place. The sounds produced by motorized boats, under sea oil and gas exploration, and naval sonar may be having significant impacts on marine mammals. Science Daily – How Whales And Other Marine Mammals React To Sonar? Question 10: The ocean is noisy. Read about a recent study done on how marine mammals may cope with all of this noise, summarize the source of this noise and what the study showed about whales reaction to it. Listen to some of the sounds we produce under water.